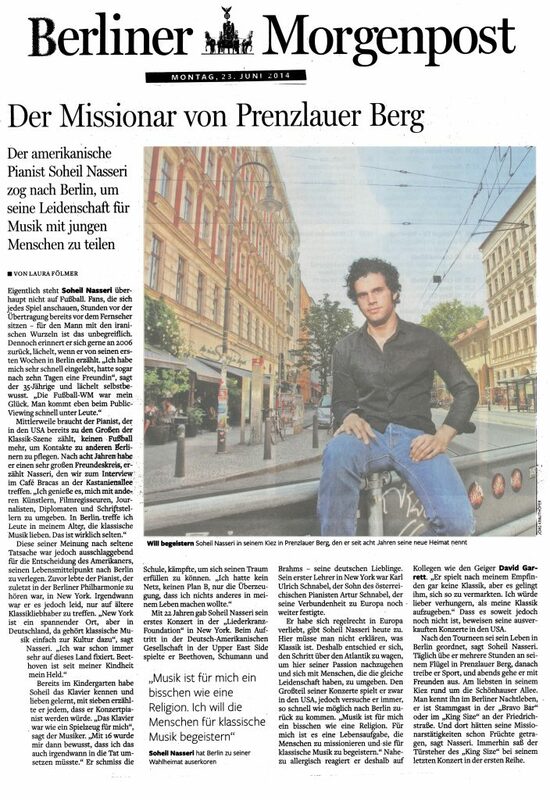 The American Pianist Soheil Nasseri moved to Berlin to share his love for music with young people. When he was 22 Soheil Nasseri gave his New York debut at the Liederkranz Foundation in New York, a Germany-American Society. At this performance he played Beethoven, Schumann and Brahms- his favorite Germans. His first teacher in New York was Karl Ulrich Schnabel, the son of the Austrian pianist Artur Schnabel. This further established his sense of connection to Europe. Soheil Nasseri admits being completely in love with Europe. Here one doesn’t need to explain what classical music is. That’s why he dared to cross the Atlantic, and sought to surround himself with others who shared his passion. Most of his concerts are in the USA, but he tries to come back to Berlin as quickly as the tours are over. “Music to me is like a religion. And I consider it a personal duty to proselytize and get people excited about classical music.” Thus almost allergically Mr. Nasseri reacts to colleagues like David Garrett. “In my opinion he doesn’t play classical music, but that is how he has successfully marketed himself. I would rather starve than give up the classics.” So far it has not come to that, as his sold-out concerts in the USA prove. After the concerts his life in Berlin is somewhat routined, Soheil Nasseri says. Every day he practices many hours at his grand piano in Prenzlauer Berg, then he exercises, and in the evenings he goes out with friends- preferably in his neighborhood near Schönhauser Allee. He is well-known in the Berlin nightlife- he is a regular at the Bravo Bar and at King Size in Friedrichstrasse. There his proselytizing has paid off, Mr. Nasseri said. After all, the bouncer from King Size was in the front row at his last concert. Photo caption: Wants to inspire people. Soheil Nasseri in his neighborhood in Prenzlauer Berg, which for the last eight years he calls ‘home’.